The Carnahan and Jack families, best known for their bravery in the French & Indian War and American Revolution, are some of the only Pearce-associated kin that have been traced as far back as Scotland. Our modern day Pearce name, of course, has roots in southern Medieval England, but ancestors before that were probably “old Brittons” with roots in pre-1066 France. Our Jacks were once French “Jacques,” sympathizers with Scottish Protestant King James, and so soon also found themselves across the channel. But the earliest known Carnahan, or Carnochane as it was spelled, was named William, and he was born about 1418 in the northeast seaside Scottish city of Aberdeen. He was the first of three generations named William. 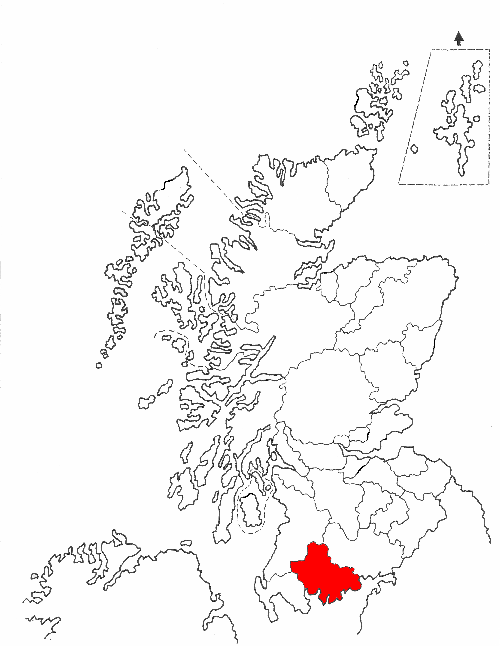 Later Carnahans have been tied to Old Galloway in southwest Scotland, an ancient land with hometowns called Wigtown, Dumfries, and Kircudbrightshire(1). At least two traditions lay claim to the Carnahan name. One says that it was originally “Baille MacKarnaghan” or the shorter “Micharnaghan,” meaning “the son of the man where there was a pile of stones in his field.” Indeed, the western coast of Scotland is aplenty with stones as it runs to the sea toward Northern Ireland, so the name is appropriate. It was to that lush farmland that these Carnahans emigrated sometime in the early 17th century, during the reign of Oliver Cromwell. The counties of Donegal, Antrim, and Cavan were their destinations. Did some of these sailors then emigrate east to Scotland and take the Carnahan name there? One more reliable source suggests that when Calvinism (Presbyterianism) spread over Ireland, they held fast to its beliefs, at odds with the defenders of Roman Catholic Queen “Bloody Mary” Tudor (1553-1580). Many of the Carnahans were slain, their properties were awarded to the Crown, and they faced imprisonment. At that time, the family split, part going to Old Galloway and practicing weaving, and the other going to Aberdeen, becoming stonemasons. Perhaps the most notable among them was John Andrew Carnahan, a delegate to an international convention in France that produced the Edict of Nantes (1598), giving protection to French Protestants (Huguenots) and allies of France. In 1685, the Edict was rescinded, beginning the persecution of Protestants and the start of great migrations to Scotland, Northern Ireland, and America in search of religious freedom. My wife’s Amish-Mennonite ancestors came to America under the same threat. In 1702, Queen Anne forbid anyone from voting who wasn’t a member of the Church of England. This, along with ever-increasing land rents, made staying in the Isles discouraging. Earlier (1681-1683) English Quaker William Penn had canvassed Europe looking for families to settle his “Holy Religious Experiment,” in Pennsylvania, so the draw to the New World was great for all Protestants, especially the Scots-Irish Presbyterians and the Swiss-German Amish-Mennonites. One thing for certain, as we shall see, is that along with their aggressive nature and their purported desire to be on the move, they were also known for their large and hearty physical stature. These three characteristics will show again and again as their descendants crossed the Atlantic and the American frontier to become brave soldiers, passionate preachers, and prominent public officials. Our Captain James Carnahan (1692-1795) was said to be 6‘ 4” “in his bare feet” and weighed at least 250 pounds. He was born in County Antrim, Northern Ireland, but became our first Carnahan in the New World. We’ll find out more about him and others as our expose continues. After the three Williams in our family came a James in 1540, and then Andro (1575-1599), probably a variation of Scotland’s patron saint, Andrew. He was born in Carrick, Ayrshire, just north of Kirkcudbrightshire, where he would meet and settle with wife Margaret Kennedy (b.1579). Their son, another William, was born the year he died, and Andro’s grandson became the first of more Jameses, also named after the King. James, Sr. and wife Marian emigrated to County Antrim, as we said above, and raised at least seven children in the small town of Legoniel. Their son James, Jr. found his wife in what is now the Republic of Ireland, County Mayo to be exact, emigrated to Cumberland County, Pennsylvania, and reared most of their nine children there. This was the family that produced our Jane (1722-1790) who married Cpt. James Jack (1728-1776). Sons of both families were active in the French & Indian War and the American Revolution, and we will devote more time to them in a minute. But, for context, some of each family moved to Western Pennsylvania. Our Mary Jane Jack wed John Cooper, and leaving Cumberland County, they followed the Susquehanna River northwestward, eventually marrying into the Fleming family in the new oil fields of Venango County. Susan Fleming found Joseph Moon and they moved back to his homestead in Allegheny County to raise their family. From there, the Moons and Marshalls, Hills and Pearces produced me. Names, dates, and Vitals are all available from each family tree. And, as we said, some of the Carnahans and Jacks also arrived in Butler and Allegheny Counties to be neighbors, and in some cases cousins, to our more recent ancestors. Not unlike the German-Swiss ancestors of my wife Susan, who preceded each child’s very common given name with that of a Bible character or saint (see “German Naming Customs”), our Scots-Irish ancestors also used and reused the names of kings and Bible figures. (See “Naming Practices in Scotland.”) This is to say that there has always been some confusion over which generation Captain James “The Indian Fighter” Carnahan belonged to. Blanche T. Hartman, in The Smiths of Virginia, claims, “The Indian Fighter, Captain James Carnahan, the elder, came with his brothers, William and Adam, from County Antrim, Ireland, to Pennsylvania between 1729 and 1733.” The problem is that Adam, son of James the elder, wasn’t born until 1739. Adam’s brother James, our Jane’s sibling, is usually referred to as James Alexander Carnahan (1719-1790) and is usually given credit as being “The Indian Fighter.” If their father James, our line, was also James Alexander Carnahan, could he have been “The Indian Fighter”? 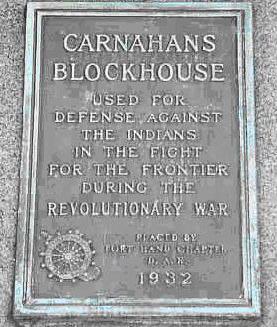 At least two blockhouses were constructed in different parts of the state sometime between the official end of the French and Indian War (1763) and before the start of the American Revolution (1776) and named after the Carnahans. These blockhouses were usually simple circular compounds of sharpened logs stuck in the ground to give nearby settlers a common place to assemble when the threat of Indians occurred. Unlike forts and log cabins, they were less vulnerable to fire, and visibility for the garrisons was greater. The first Carnahan blockhouse was said to have been located on the family farm along the creek next to the mouth of Brady Run in Cumberland County. The second, whose commemorative plaque is shown below, was at the Old Hannastown settlement in Westmoreland County(2). The blockhouse is said to have been built by another of our Jane’s brothers, John, who was killed by Indians while trying to protect his family and others just after the start of the Revolution. His son David later killed the Indian that had killed his father. A source believes that this all took place at yet another blockhouse named for the family located just north of Hannastown near a little town that is today called Salina. Before his death, this John Carnahan (1720-1778) had reached the rank of Colonel and had been appointed the Sheriff of Westmoreland County. He married twice, the first time to the daughter of nobility, Lady Sarah Allen. She is possibly related to our Pearce-associated Allens. His second marriage was to Eleanor Jack, the sister of our Cpt. James Jack, Jr. who married our Jane. Between the two marriages, a dozen and a half off-spring were produced. Another untimely death occurred in Col. John’s family when Lt. James Carnahan, his son and member of the Pennsylvania Rifle Regiment, was accidentally drowned in the Allegheny River above Pittsburgh in 1786. There is great reason to apprehend that the country will again be immediately involved in the horrors of an Indian war; that our circumstances at this critical time are truly alarming; deserted by the greater part of our neighbors and fellow subjects, unprotected with places of strength to resort to with ammunition, provisions, and with almost every other necessary store. Our houses abandoned to pillage; labor and industry entirely at a stand; our crops destroyed by cattle; our flocks dispersed; the minds of our people distracted with the terrors of falling, along with the helpless and unprotected families, the immediate victims of savage barbarity. In the midst of these scenes of desolation and ruin, nest to the Almighty, we look to your Honor, hoping, from your known benevolence and humanity, such protection and relief as you Honor shall meet. It’s no wonder that Northern Ireland and Cumberland County, PA, that produced so many American military men proudly bestowed the title “Indian Fighter” on soldiers such as our James Carnahan. On a lighter note, our Jane Carnahan’s brother William produced a line with several other brands of famous people. First, a pioneer Presbyterian preacher named Rev. J.A. Carnahan proclaimed the gospel as far west as Tippecanoe County, Indiana, conducting religious services in primitive places of worship for the settlers, and until the year 1835, at private houses. 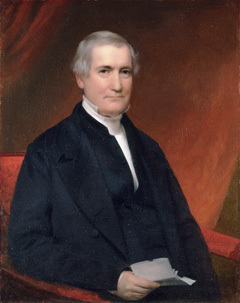 Uncle William also had a grandson named James (pictured below) who graduated from Princeton (Class of 1800) and holds the distinction of serving as its President longer than any other, 1823-1854. Despite early problems with students and declining enrollment, under his later reign the enrollment doubled and the number of faculty tripled(3). Did you know that the southwestern Pittsburgh suburb of Banksville was laid out by a Carnahan? Alexander Carnahan (1789-1897) was the third son of David, born in County Antrim and probably a grandson of our James. Father David enlisted as a private in the Revolutionary War after emigrating with his parents to Cumberland County. He later was able to purchase 400 acres to farm in Allegheny County, probably originally Depreciation Lands. Son Alexander inherited much of the property and after his first wife died, he married Eliza Banks, for whose family Banksville is named. Today, Carnahan Road there memorializes his family. Alexander served in the War of 1812, was elected a Justice of the Peace, a County Commissioner, and Representative to the State Legislature. This is the strong Carnahan leadership trait we suggested earlier. Other famous more modern day American Carnahans include a member of the U.S. House of Representatives from Missouri, John Russell “Russ” Carnahan (b. 1958), and a former Governor of Missouri, Melvin Eugene “Mel” Carnahan (b. 1934). Screenwriters, directors, producers, actors, and athletes round out the Carnahan Who’s Who. For example, Andrew Carnahan (b. 1983) was an offensive tackle for the New York Giants. No doubt some of these persons are related through our James Carnahan. Even though our Carnahan line stretches a long way back to Scotland and ends with the marriage of Mary Jane to John Cooper around 1780, the rich history is exciting to consider. Few families can boast seafaring war-mongerers in the same breath with Indian Fighters, Revolutionary War heroes, preachers, and college presidents. Our research into our Carnahans continues with the expectation of finding much more under those “stones” for which our first “Micharnaghan” or “Carnochane” was named. 1. As recently as 1975 many of these burgs and boros were merged for better representation in the Scottish Parliament. 3. Before that, he had established the Department of Classics at Georgetown University in Washington, D.C.
Carnahan, Rod. “Thomas Carnahan Bio.” 9 April 2014. “Carrick, Scotland.” 8 April 2014. History of Cumberland County. p. 809. 7 April 2014. “Meaning of the Carnahan Name.” 8 April 2014. “Petition of the Inhabitants of Westmoreland and Ohio Counties.” 9 April 2014. “Rev. J.A. Carnahan.” 8 April 2014. “Site of Old Hannastown.” 8 April 2014. Various Public Member Family Trees & Other documents. Hello. I’ve been researching my mother’s side (she is a Carnahan), and I would like to know if James Carnahan from Legoniel, Co. Antrim was in the Revolutionary War. Is there documentation? I know that the Carnahans have been in America since at least 1720 and have found enough information that they were indeed part of the French & Indian War. My mother is the great-granddaughter of Thomas Abraham Carnahan and his wife was Mary Taylor Carnahan (reportedly half-Native American; I have found some information in my family that she was Seneca). I have not found anything about her mother. Do you have any information on this line. Mary’s father was a Methodist minister who went by the name of Obadiah Taylor. James, Sr. would have been age 84 when the American Revolution began, but his designation as “Indian Fighter” would suggest that he was active in the French & Indian War. Son James was also born in Ulster and fought in the Revolution, according to my listed sources. I can’t locate Thomas Abraham Carnahan. Have you found him in my postings? BTW, our family’s possible connection to Obadiah Taylor happens several times (see Miller-Berkey tree). Thanks for your information, and please stay in touch. Margaret Kennedy (b. 1579) in Maybole, Scotland; wife of Andro Carnahan (1575-1599). Her family seems to trace back to Charlemagne and beyond. Very interesting, Barbara. Could you send me what you have? I’d like to give you and your sources credit. Hi Larry and Barbara, I would also like to do whatever reading it is that you have. Since I’m one of the early Carnahans’ direct descendants, a link to Charlemagne interests me very much. “After Grandpa on the first line, the next line down shows the parents of the person above. 3. THOMAS KENNEDY (1545-1602) m. ELIZABETH MACGILL Thomas Kennedy lived in Dunure Castle, which is now in ruins. His family built Culzean Castle, though it is unclear whether or not he ever lived there. Google Culzean Castle. It is a palace and has a lot to see. Thomas Kennedy’s ancestors had married a Stewart. They lead directly back to Walter Stewart, who married Margaret, daughter of Robert, The Bruce, King of Scotland (1300s) and who descends from a long line of kings. Because the title of king is often hereditary, and because kings tend to marry daughters of kings from other countries, our ancestors include huge numbers of kings and other noblemen. Also, because kings are part of history, their ancestors can often be traced. I have been working on Ancestry.com for about a year, and have followed the Kennedy – Stewart line back to Charlemagne. From there, the line goes back to Roman Emperors, Babylon and even Egypt. Of course, the ancient work has been done by other people, and there are always the possibilities of mistakes. However, I consider the general premise to be good. It is a fun and impressive list, which I have attached. As one in a long line of Carnahans, I was delighted to come across your page and see in it some of the very history of my family that was told to me by my grandfather. His (and my) lineage is traced to Alexander Carnahan of Banksville who was a son of David Carnahan; settled in Pittsburgh around 1742 (?) after having moved from Co. Antrim to Carlisle, PA. The family never left Southwest PA and continues to be residents of the greater Pittsburgh area. I am in possession of an extensive family history provided to me by my grandfather upon his death. I would be interested in corresponding with you.